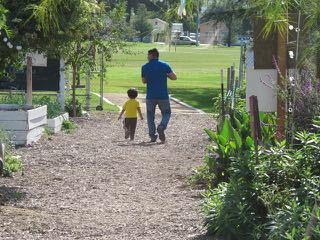 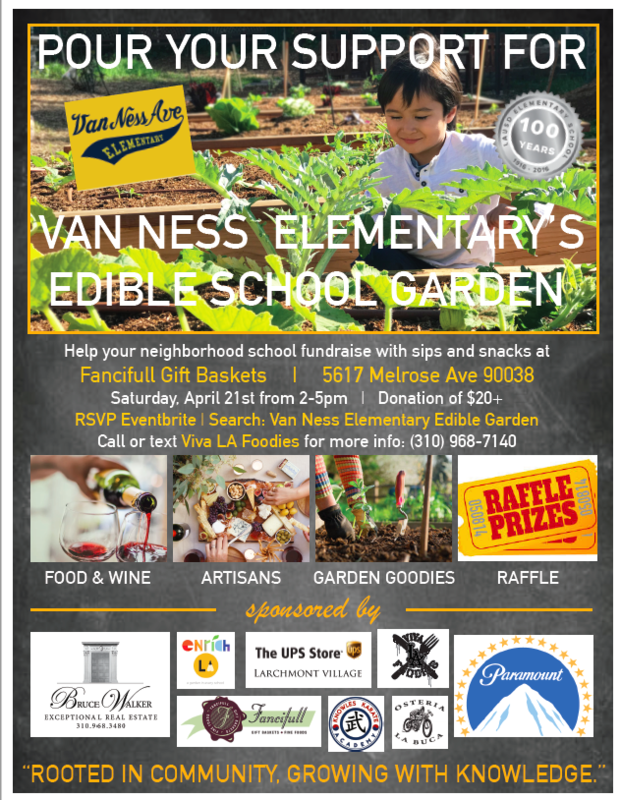 We were fortunate enough to spend Earth Day 2017 experiencing the magic of the Huerta Del Valle Community Garden that is literally cultivating community one plant at a time on their steadily expanding parcel of 2.5 acres in the inland Los Angeles community of Ontario, California where San Bernardino and Los Angeles meet. 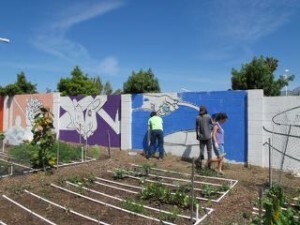 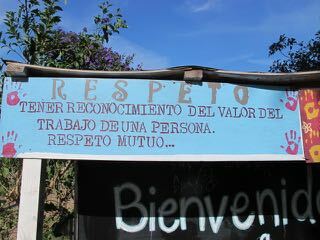 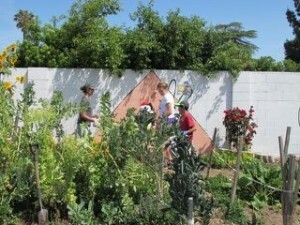 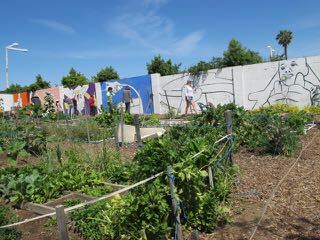 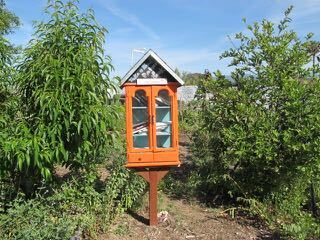 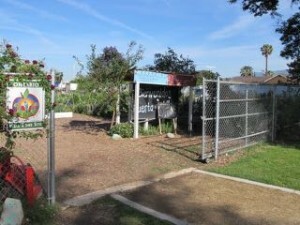 Huerta Del Valle is a community garden located in Ontario, California about 35 miles east of downtown Los Angeles. 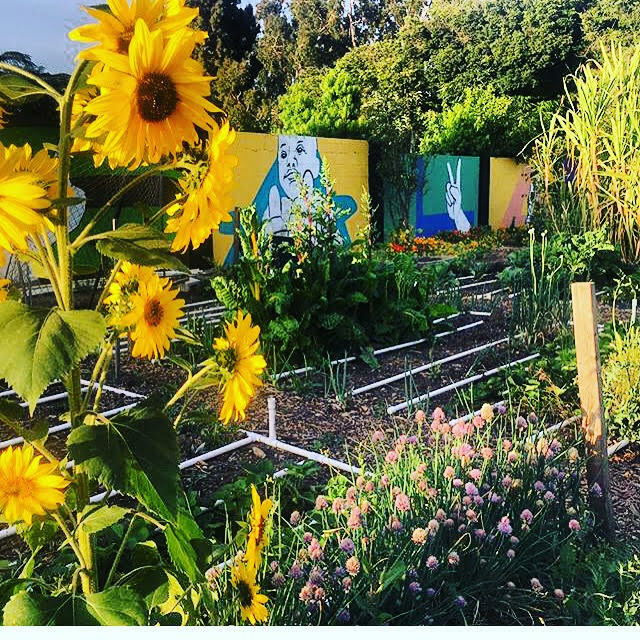 The organization’s urban farm plot grows over 100 different types of vegetable crops ranging from pantry staples like cherry tomatoes and zucchini to specialty produce including fennel, kohlrabi, edible flowers, and a colorful array of aromatic herbs. 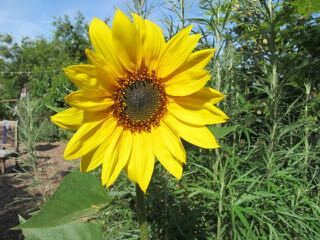 Wild sunflowers and poppy flowers decorate the landscape of the property and the picturesque San Bernardino mountains in the distance provide a beautiful backdrop and make it feel like you are in a painting. 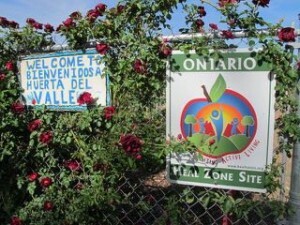 Families, Volunteers and local community organizations make the Huerta Del Valle garden their home-away-from-home and tend to each densely planted parcel of cultivated farmland as if it was in their own yard. The mission statement says so much about how deeply they believe in providing a sense of community and taking pride in all that they do. 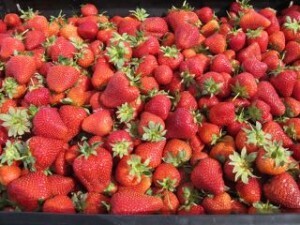 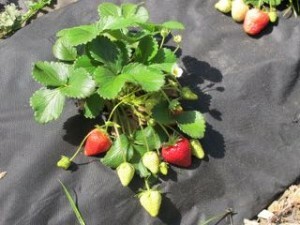 They currently cultivate thousands of pounds of produce on site and sell to restaurants, markets, as well as selling on-site for the affordable price of $1/lb for everything grown. 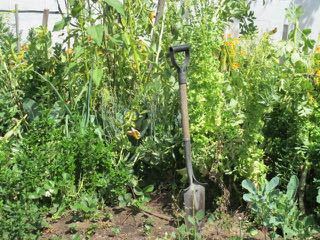 Visitors to the property can also volunteer and get free veggies or fruit for the generous exchange rate of 1 hour of labor = 1lb. 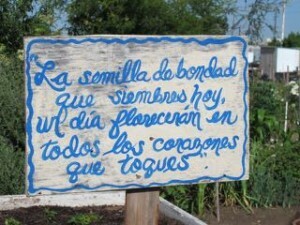 of produce. 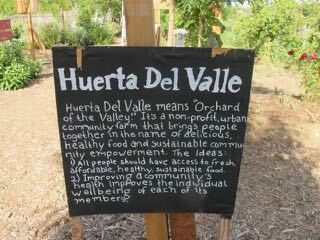 Upon our arrival we met Arthur Levine, Projects Manager of Huerta Del Valle who oversees the organizations farm facility and participates in local outreach programs in the community. 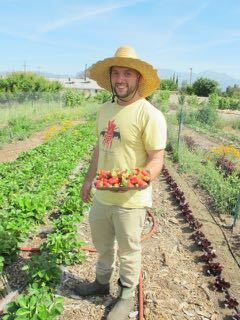 He curates the farm operations, plant crops to plant, harvests, CSA box assembly and does outreach to local schools and groups. 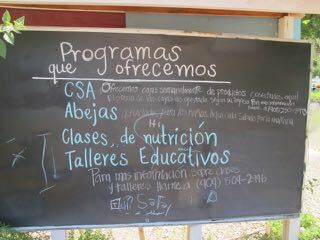 During our visit he was working with his group of volunteers as they were in the final stages of harvesting and cleaning vegetables for their “Earth Day CSA Harvest and distribution event” as well as assisting farm guests with their questions and concerns as well as directing them along the property to several nutrition classes, yoga classes, beautification projects on the property that included a mural project curated by Crewest Gallery’s own Man One (Alex Poli) a local artist, mentor and entrepreneur doing community outreach throughout California and beyond. 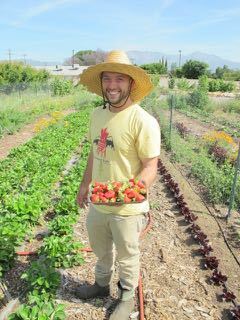 Arthur told us that his hobby is working with local groups to showcase the importance of urban farms, community gardens as well as providing agriculture consulting as well as educating others about the importance of sustainable urban farming and the benefits it provides to the community at large. 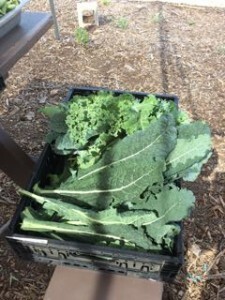 The CSA (Community Supported Agriculture) box of produce contained Strawberries, Cactus pads(Nopales), Snap Peas as well as a diverse array of leafy greens including Collard Greens, Chard as well as locally picked oranges from neighboring properties. 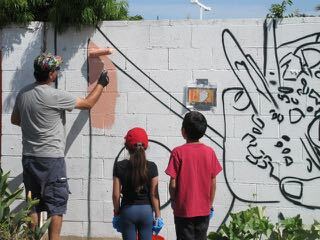 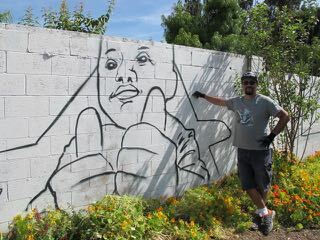 Alex Poli who goes by the artist name Man One connected us and when he mentioned the cause and that he was working on a mural project community painting event that coincided with “Earth-Day 2017” and it was a sure thing that we would be there covering the action for our readers and to bring awareness to all of the amazing things that Huerta Del Valle is doing for its local community and hopefully they can serve as a model for other Community Gardens around Southern California and beyond. 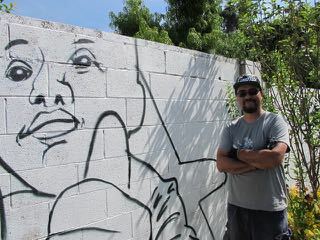 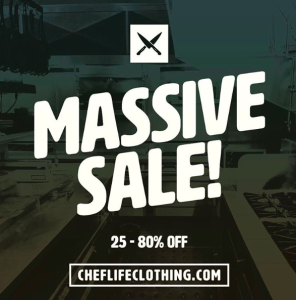 We met thru the local graphic art/graffiti art scene and were connected and introduced by a mutual friend of ours, Seth “Meex One” Wilder at a Downtown LA/Chinatown art event several years ago. 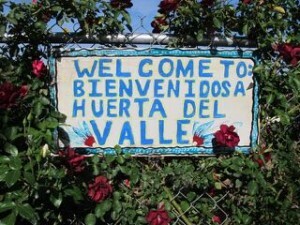 With lots of mutual creative artist friends in common it only made sense that when the opportunity presented itself to come down to showcase the great things that the Huerta Del Valle organization is doing and the community outreach programs that they participate in we would be right in our element among Food, Art, Culture and Education. 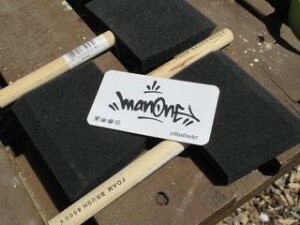 Man One is more than just an artist, he is a curator, mentor, teacher and entrepreneur who believes that art is a powerful tool and has the “power to save lives and make the world a better place.” He also understands that “art gives mankind an essential and irreplaceable cultural language in which to express and know itself. 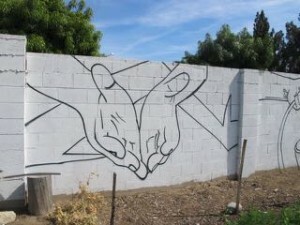 Man One believes art can transcend cultural and socio-economic barriers, fostering understanding, mutual respect and unity among disparate peoples.” This is especially true given todays divided nation and tumultuous political environment where people are doing their part with political activism in light of governmental fear-mongering and unjust immigration policies as things relate to Sanctuary Cities. 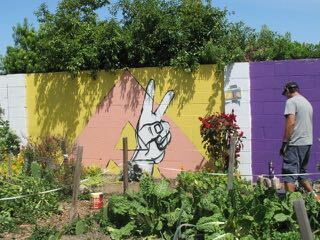 We felt none of those pressures as this particular H-D-V community embodies Respect, Peace, Unity, Integrity and is all working towards the common good which is a sense of community. During our visit Alex connected the dots and explained to us that he was led to the Huerta Del Valle project and introduced to the farm by a good friend and Associate Professor of Environmental Analysis; Susan Phillips, Academic Director, Pitzer in Ontario Program who had done and continues to work on outreach projects with the urban farm in Ontario. He mentioned that he had been on the project for over 1 year and the commissioned mural project had its shares of ups-and-downs as well as hurdles and obstacles when dealing with planning, permitting and ultimately local government approval. 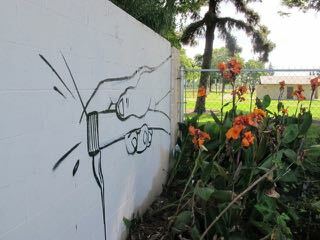 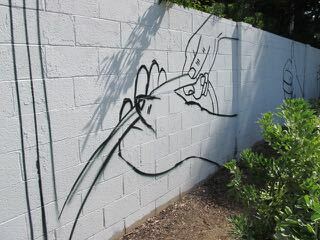 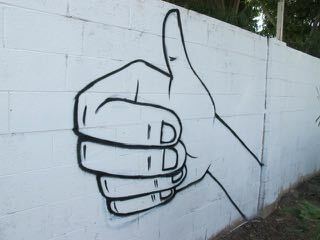 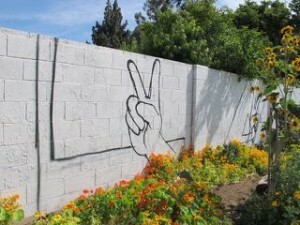 Since he is an experienced mural artist this would not serve to be a problem in the end. 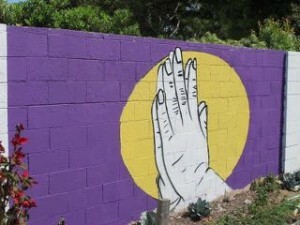 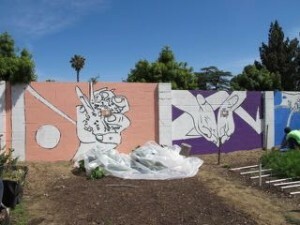 He eventually convinced the city council that the bright color palette that was selected for the mural is in line with his artistic style and was not going to compromise on his original vision. 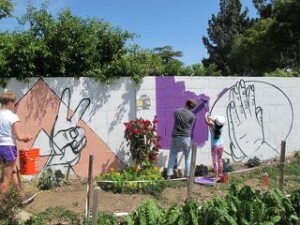 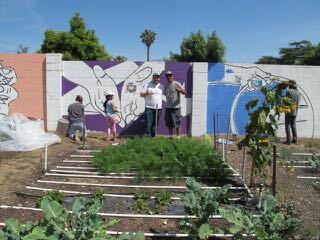 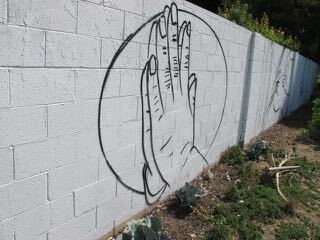 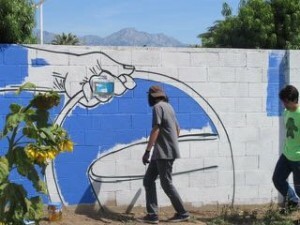 The City council ultimately approved the project and now the rest is history and the mural “Manos a La Obra” was born on Earth Day 2017 and came to life on April 22, 2017 with the help of many community volunteers and visionaries who wanted to memorialize the day in the garden and provide a backdrop for the garden and be a reminder for future inspirational projects and community building at the Huerta Del Valle, Community Garden. 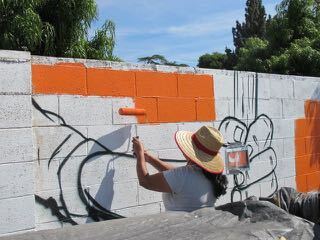 Man One titled the work “Manos a la Obra” which translates from Spanish into English and simply means “Lets Get To Work” and can also be used in a context of “All Hands On Deck” in reference to accomplishing tasks as a group, unit, team or community. He was inspired by people working at the garden who not only cultivate their own crops but also volunteer and donate time to grow food crops for the community. 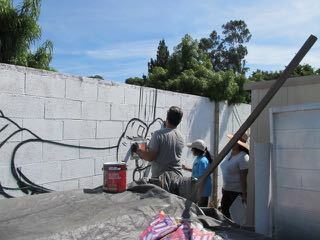 When we arrived the mural was impressive and was outlined in “black” on a white freshly painted cinder block wall and by the end of our visit it came to life and was mostly filled in with bright pastel/pantone colors that were donated by local organizations. It was an Organic experience and people kept coming up of all ages asking to paint from children as young as 5 years old all the way up to Senior citizens. 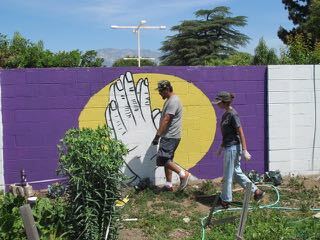 Man One would provide a brief safety meeting and go over the sections that they were going to paint as well as direct a specific painting technique for them to apply with paint rollers as well as finer detailed brushes for more intricate brush work. 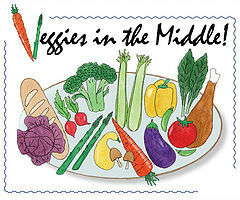 We also had time to sit in on a food and nutrition class taught by Jolene Redvale from Veggies in the Middle who is a food educator and certified nutrition consultant and cookbook author of “Yellow Orange & Red, Veggies to Warm Your Tastebuds” from Mentone, California. 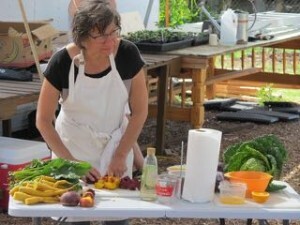 She taught community members and guests a nutrition class about the importance of using farm-fresh local ingredients as the centerpiece for all of their meals and to adapt their own recipes to this methodology. 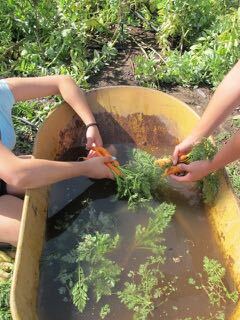 Some key take-away points from her class were the importance of full utilization of all fruits and vegetables including saving peelings and veggie scraps that would normally be simply thrown away. 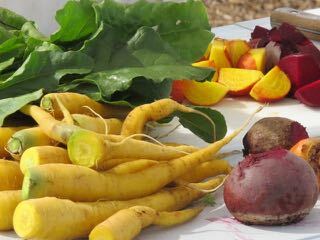 These scraps will later become flavorful and nutritious vegetable stocks, soups and serve as the base ingredient for many culinary dishes. 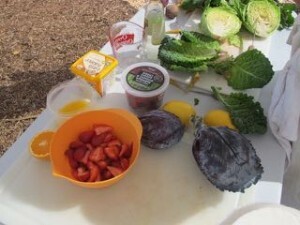 She cooked beets in water on the portable stovetop during her chef demonstration and mentioned the importance of saving the “Beet liquid or stock” and utilize it in a soup at a later time. She also mentioned that people should save roots, skins and any trimmings from vegetables in freezer safe ziplock bags to make veggie soup stock (every 2 weeks) or when enough trimmings accumulate. 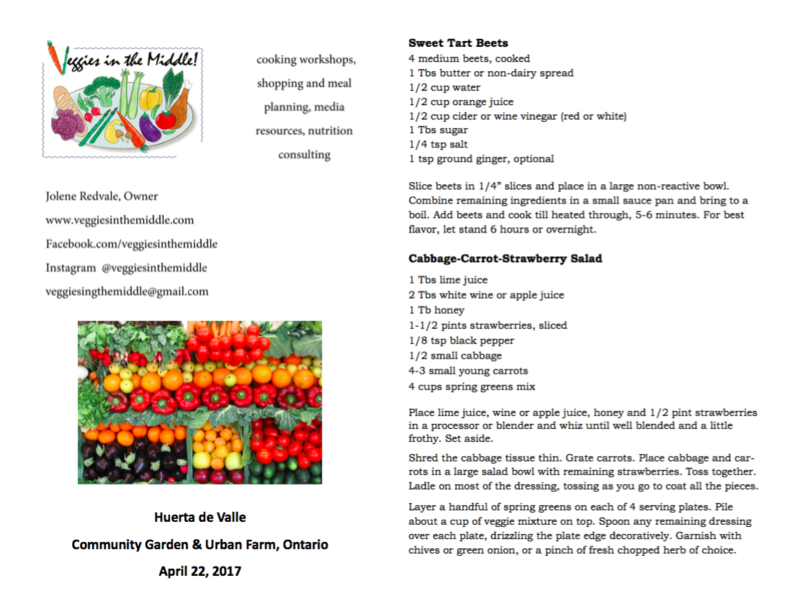 She demonstrated a raw “Cabbage-Carrot-Strawberry Salad” with tender leafy greens, carrots, strawberries and so many more of freshly picked fruits of vegetables as well as w her own version of preserved pickled beets. 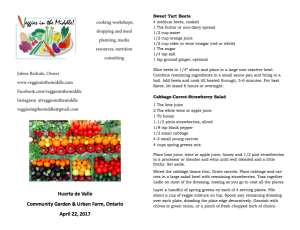 Take a look at her website for more information and to get a copy of her cookbook or schedule a private workshop. 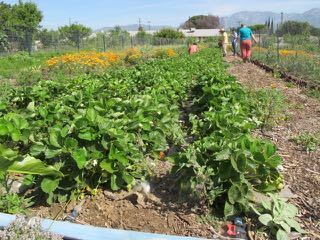 Now we are certainly sure that you are now asking yourself; What can I do to get involved in the Huerta Del Valle Community Garden? 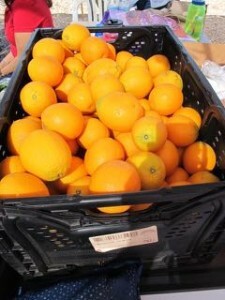 There are many low-cost ways to participate in the many programs that are offered and some are as simple as volunteering your time in exchange for vegetables and other produce at the fair exchange rate of 1 hour = 1lb. 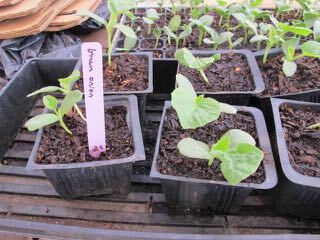 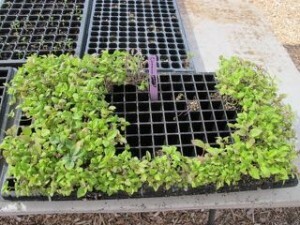 Shop for your fruits, vegetables and herbs at the farm. They offer the low rate of $1/lb. 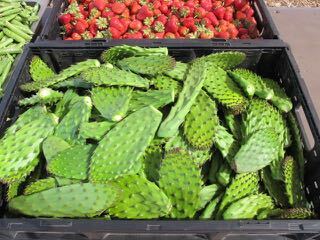 of produce purchased by the public at the farm which is much cheaper than any supermarket or farmers market and much fresher. You can also make a monetary donation to the farm in any amount via their website. 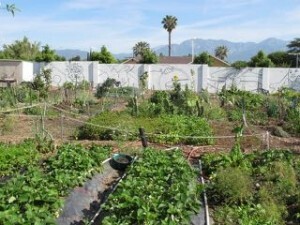 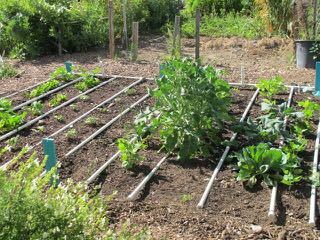 Start and farm your own plot of land at the garden with plots of land for farming costing the nominal fee of $30/yr and this low price includes seeds, soil, fertilizer and irrigation for your crops. 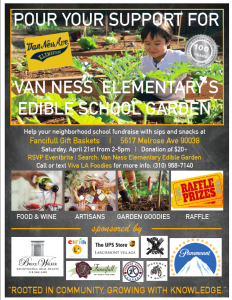 Share this post on your social media sites and help spread the word about this great local organization. Subscribe to a CSA box to be picked up at the farm. 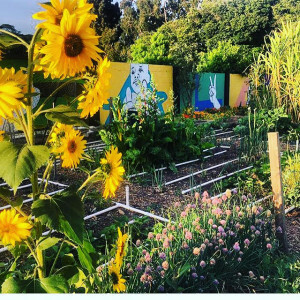 If you want to get more involved please contact us directly and we can collaborate on some ideas that we have in mind as a way to give back on a grander scale. And we had to include a few more progress photos of the Man One, Mural as it neared completion during the Earth Day 2017 Community Event. 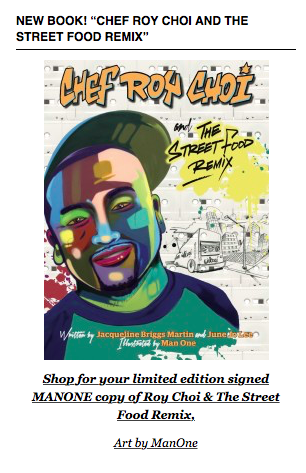 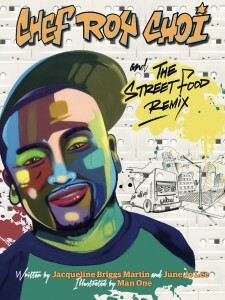 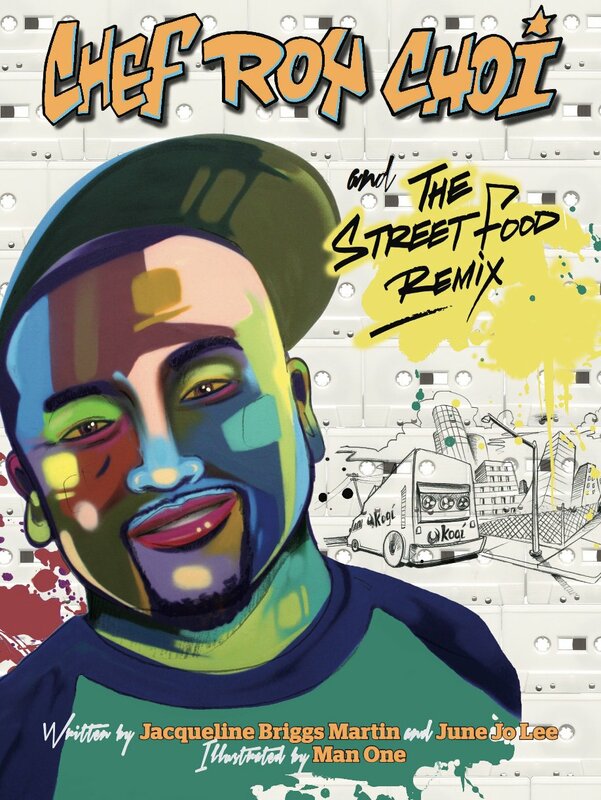 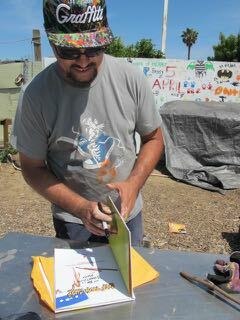 Man One signing a copy of his limited edition children’s book “Roy Choi & The Street Food Remix” for us. 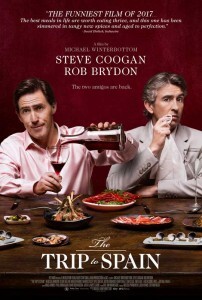 • Priority access to tickets for our Feast Under the Stars by Celebrity Chef event-fundraisers. • Access to Huerta workshops at no cost.